Sole treadmills review. Are these treadmills that good? The Sole F85 folding treadmill is the top model in the brand’s folding series that is suitable for serious exercise buffs. Each of the Sole treadmills is made with powder-coated, and stable heavy duty inclines. The F85 stands out for its industrial quality, and continuous duty motor. It also has a zinc-coated balanced integrated flywheel. The flywheel can reach at up to 12 miles per hour and be inclined up to 15 percent. Its flywheel is also heavier than those of other brands are. This feature enables runners to have a fluid motion that they experience in the gym. In addition to these great features, Sole also added the Cushion Flex system. The whisper quiet and low impact features of the Flex deck make the equipment suitable for runners especially those with walking or running-related injuries. It significantly reduces the impact on the feet, knees, ankles, hips, as well as spine up to 40 % if we compare it with asphalt. The Sole F63 folding treadmill is well suited for home use of its space saving design that can be folded and locked securely. This treadmill has a strong 3.0 duty HP motor that can reach the speed of up to 12 miles per hour and be inclined up to 15 %. The F63 can also run up to 6 present programs that include fat burning and Cardio Training. It has additional safety features comes with a large stop switch, and a low speed start. The great thing about this model is that you can see information on time, speed, distance traveled, pace, incline, pulse, and calories in the vibrant blue display. You adjust the incline with the hand rest controls that are conveniently located in the equipment. You will also find a quarter-mile track function that helps the users work on speed training. Lastly, the treadmill also is also MP3 player-compatible and has built-in speakers that enable you to listen to your most favorite tracks while you are working out. The Sole F80 folding treadmill has a heavy-duty 3.5 continuous HP motor that can reach up to 12 miles/hour and can be inclined up to 15 percent. It also includes the brand’s Cushion Flex Whisper Deck trademark. This feature has been proven to reduce the impact on the user’s joints by up to 40 percent when compared to asphalt. You can enjoy six preset programs, 2 heart rate programs, two workout programs, and many safety features including a low-profile running hood and a large stop watch that starts at 0.5 miles per hour. The Sole F80 can be also be conveniently folded and locked into place in order to save space. In addition to the superb features mentioned, the F80 has a vibrant LED screen that shows clear instruction as well as feedback on its message board. You can see information such as time, pace, speed, distance traveled, incline, pulse, and calories. You can also see a 1/4 mile track feature catered for various programs. To make things even better, the treadmill also includes built in speakers that are compatible with MP3 players so that you can listen to your most preferable play list for a better workout experience. 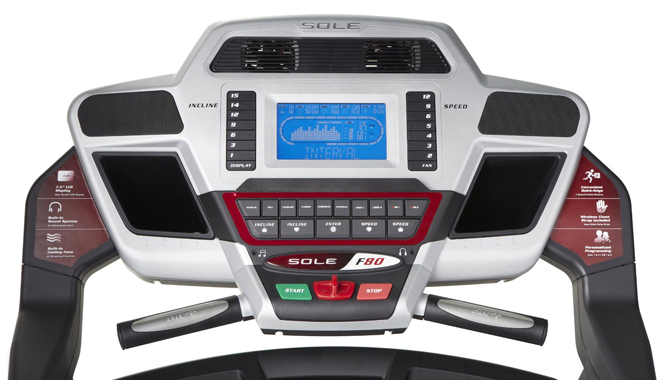 The Sole Fitness boasts of many technologies included in its treadmills. The first technology is the Folding Deck feature that has a licensed all gear rack and pinion system. When the equipment is in an upright position, its Safety Lock Deck locks the deck securely into place. The F80 model has a Folding Deck Design that allows the user to release the deck. You should know that the deck would unfold itself after you step back. The second is its Convenient Controls that offer a control console with fast speed and increase adjustment button. These buttons can be found conveniently along the sides of the equipment’s LCD. The third technology is the Precision Wield Frame. This is an industrial-strength and solid-built frame that is durable enough to handle multiple use by users with different heights and weights. The fourth technology is the Sole LCD features a vibrant blue screen that has organized and easy-to-read readouts. It provides helpful information such as speed, pace, heart rate, calories burned, and others for the users. The fifth technology is the Integrated Message Board that includes an alphanumeric text center. This feature sends scrolling messages in order to assist the user throughout his or her workout details. It also provides a recap of the entire workout once done so the user can check his or her progress. The sixth technology is the High Torque Motor with Flywheels that includes powder-coated, stable inclines, heavy-duty motors with big diameter, and all steel since coated balanced flywheels. This makes running and walking on the surface vibration-free to make it safe and secure. Each Sole treadmill includes the heaviest duty motors and chassis in its class. The seventh technology is the 2.75-inch Rollers. Such as roller has a sealed bearing design. Each roller is made from copper ground wires, and reduces static. These rollers are made for a big contact surface. It also has a longer roller as well as belt life. The last technology featured is the brand’s Belts. Sole treadmills have woven two-ply belts that have four layers. These include two rubber layers over a PVC layer in the middles, and a nylon backing that rolls one the rollers and deck. The rubber layers provide the Stability. The PVC layer hinders the belt to avoid over-stretching. Lastly, the nylon offers a smooth surface that glides over the deck and rollers.